Four vehicles are being considered by the Czech Army to replace the aging BMP-2 Infantry Fighting Vehicles of the Czech mechanized infantry battalions, and other heavy elements of the Army: ASCOD 2, PUMA, LYNX and CV90. A specific topic has entered the debates: should the turret of the basic IFV variant be rather unmanned, or should the commander's and the gunner's seats be inside... The competitors would find a solution in either situation certainly. What are the advantages of the unmanned turrets? It does not say, however, whether the turret is to be manned or unmanned. The question may be indirectly linked with another requirement: the vehicle is to be able to carry, besides its crew of three, 6 soldiers and 2 specialists, for a total of 11. Provided this requirement won’t get changed. Three of the vehicles taking part in the tender were presented with unmanned turrets, Lance turret of the LYNX is manned, and also the basic CV9030CZ variant comes with a manned turret. ASCOD 2 offered by GDELS is fitted with the Samson Mk 2 Remotely controlled Weapon Station mounted with the 30mm Bushmaster II cannon (200 rounds), a coaxial machine gun and the retractable dual-launcher for the Spike-LR fire and forget ATGM. The vehicle platform can be fitted with a manned turret. PUMA by PSM (Krauss-Maffei Wegmann and Rheinmetall joint venture) comes also with an unmanned turret mounted with the 30 mm Mauser MK30-2/ABM (400 rounds), 5.56 or 7.62 machine gun, and dual-launcher for the Spike AT missiles too. CV9030CZ r offered by BAE Systems (which recently sold control of vehicles arm to Rheinmetall) is fitted with the unmanned Kongsberg’s Protector Medium Caliber Turret 30 (MCT-30) mouted with the 30mm Bushmaster II cannon, Mk 52 chain gun, and a AT dual-launcher as well. The basic CV9030CZ variant is fitted with a manned turret. LYNX produced by Rheinmetall has the LANCE turred, manned by the commander and the gunner, mounted with the same cannon carried by PUMA, with 200 rounds stored in the turret; the machine gun is carried in an external container, and the dual ATGM launcher is dampened on this vehicle, which alows to store loaded missiles for a longer time without vibrations. The advantages of an unmanned turret are quite obvious: the turret being a critical, most exposed element of the vehicle, seating the crew members in the better protected hull in lower position brings more safety. The remotely controlled turret also offers to isolate the crew and the transported troopers from ammunition, which again rises their chances in case of hit. At the same time, unmanned turret is smaller. More difficult to detect, more difficult to hit, and can be lighter as it does not require strong passive protection. And concerning its size, the other question is to be considered: the capacity of ammunition to make the vehicle more or less dependent on direct logistical support. And there are two major disadvantages. In case of malfunction, the unmanned turret cannot be operated manually. In case of Main Battle Tanks mainly, but for an IFV the situation is similar, it may also be rather difficult for the commander and for the gunner to „feel“ the vehicle, and it’s weapons; they depend on cameras only. Yet for an IFV there is one other major point: it’s simply two more people in the hull. The smaller unmanned turret is payed more likely by a relatively larger hull, or reduced capacity, or protection, fuel capacity, etc. etc. There are solutions, and the final balance is a question of many different features of course, materials, technologies. Czech Army would like to get an IFV able to carry 8 troopers. ASCOD 2 in the IFV configuration carries 7 troopers; its APC variant has a crew of 2, and can transport 8 troopers. PUMA can transport 6 troopers; two seats less than required – not that it would be small, it is „just“ very well protected. CV9030CZ meets the requirement and can carry 8 troopers. The LYNX (KF41) also meets the requirement, it can carry 8 troopers. 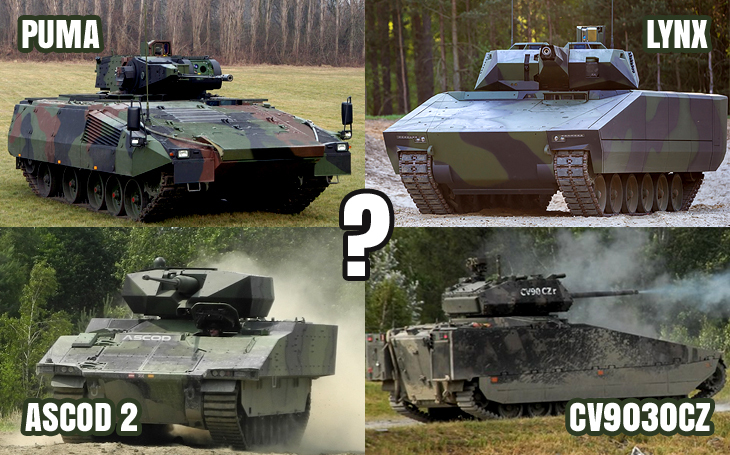 Which one will it be... and would the manned/unmanned turret configuration play a role? There are more important, strategic, economic reasons, to drive the decision. Such as the level of involvement of the Czech defence industry into the project. And it may be difficult for the army to formulate a preference concerning "minor" technical or tactical details, as it would certainly be interpreted as preference for a concrete vehicle. We will see soon.